Imagine my surprise when a representative of BlueStar contacted me to see if I wanted to receive a copy of Chef Ryan Scott’s brand new cookbook, “One to Five” to host a giveaway for my readers. A perfect holiday gift. Chef Ryan Scott says "the philosophy behind One To Five is so easy you will want to kiss me". And I agree: name a simple ingredient and he'll give you a quick way to prepare it that can be transformed into five great dishes to serve throughout the week. "Keep it simple, get it to the table and enjoy the meal". We are keeping our meals simple these days and have been relying on our CSA veggies and local chicken and meats to put quick and healthy dinners together. This week I received watermelon radishes in my veggie box, and I made a salad for dinner one night. Topped with cheese, bacon, dried cranberries and sliced apples. We made Ryan Scott's Mozzarella-Stuffed Crispy Portobello Burgers and both gave it five stars. Ryan Scott is a chef, restaurateur and Emmy-Award winning food host. He appears regularly on national television, including Today and Rachael Ray, and is the host of The Ryan Scott Show, a weekly radio show. Ryan is chef and owner of Finn Town in San Francisco. “One to Five” is his first cookbook—endorsed by celebrated chefs and TV personalities including Rachael Ray, Sunny Anderson, Carla Hall, Kathie Lee Gifford and Hoda Kotb. This the part I love. “When it comes to cooking at home, if I can’t prep it, cook it, and sit down to eat it in an hour or less, I don’t want to do it. It’s just that simple,” says Scott. “One to Five” is cooking for real life: master one basic recipe and learn shortcut solutions to spin it into five quick, affordable, and crowd-pleasing dishes. Chef Scott offers ingenious tricks and guidance on stocking the fridge, freezer and pantry to help home cooks streamline the cooking process while demonstrating how to think creatively in the kitchen. When we remodeled our kitchen 10 years ago, we chose a BlueStar range. It is constructed with commercial-grade stainless steel, and is designed to withstand the rigors of the busiest home kitchens. BlueStar®gas ranges provide the home chef with a cooking experience that only can be matched by a restaurant kitchen environment. Leave me a comment, and I will pick one winner on November 25. GOOD LUCK!! I hope you win. I know I would love to win this!!! I am joining Foodie Friday at Rattlebridge Farm. What an spectacular salad dish you prepared! I love the idea of "an hour or less", I feel the same way and have been searching for new recipes for our abundance of CSA fruits and vegetables this year. An hour or less - that's me, baby, now if the cook would just come with the book! Your salad looks amazing, Debbie. Congratulations Rita, you are the winner of the cookbook!! Now wouldn't it be great if Ryan would just come with the book! I marvel at watermelon radishes..beauty! Debbie Wow! The colors are fabulous with the MacKenzie Childs dishes! Love your choice of recipe and photos. This should be a great cookbook. 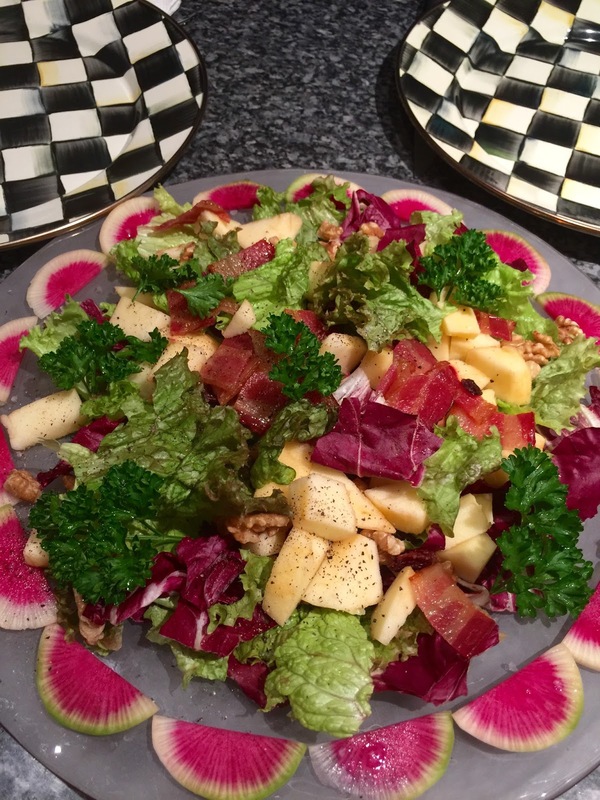 Watermelon radishes always make the prettiest presentation, and yours with the Courtly Check is gorgeous! What a pretty dish! Mouth-watering pics! Looks like a wonderful book! That crispy mushroom burger and a side of your salad…that has to be a taste treat for sure. Debbie, such a beautiful dish and so healthy. I love the presentation and have often admired your MC dishware. That mushroom burger looks amazing. Lovely giveaway, but don't count me, because I won your last giveaway.